I don’t know an.y.thing. about nutrition and so whenever I make a discovery I assume that probably everyone else out there that is even remotely nutritionally focused knows about it. And this is one of those things. When choosing your ingredients… think about colors. It’s amazing how easy it is to get a variety of nutrients when you simply vary color. Plus, to me, a pretty salad is always immediately more appetizing than all green. So, if you have a green celery… then choose a bright orange carrot. Or if you have a red tomato, choose a yellow bell pepper to compliment it. 1. Get out your two salad bowls, cutting board, knife, and all your veggies. 2. Start out with chopping up the carrots, celery, and halving the tomatoes. As you go you’ll see how the bowl really fills up with the “good stuff”. If you realize that you’ve got way too much of a particular ingredient just put the extra in a tupperware for tomorrow. 3. 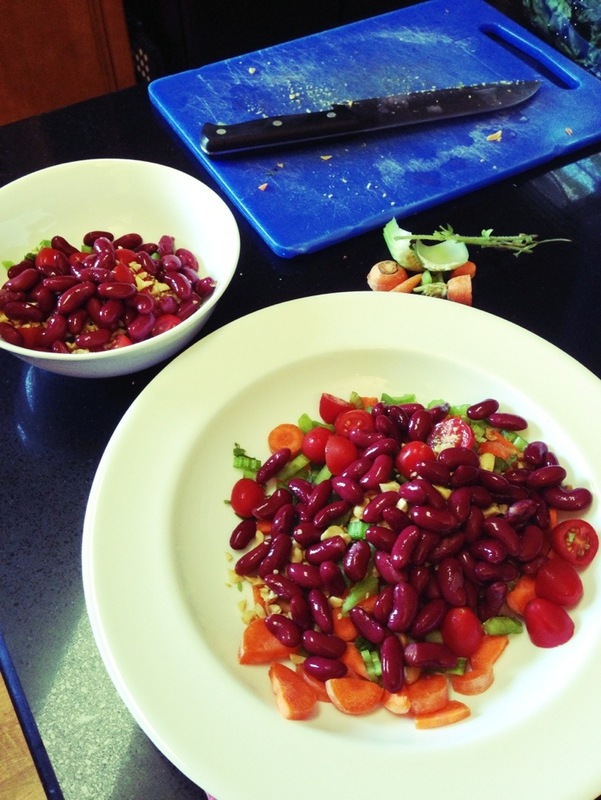 Add in your peanuts, kidney beans, oregano, and feta and mix everything together. That’s right… no lettuce yet!Just look at how full your bowl is of all the good roughage with all the good nutrients… too many of our salads are filled with 80% LEAVES because that’s what we put in first… but I think that’s part of the reason that we all get so burned out on them! 4. So, NOW, add your leaves (aka: lettuce) and some dressing. 5. This step is negotiable, but I always chop-mix my salad at this point. I like to do it because it is a good way to really mix everything together, plus I have terrible TMJ and so my bites have to be pretty small. You can chop-mix it by dumping it all out on a cutting board, but that is a mess and a half. Or you can get a good serrated knife (like a steak knife) and a fork and just cut it up a lot. OR, you can do my favorite method and get a pair of these salad choppers which I use for tons of stuff. Okay, so it’s not like some kind of phenomenal life altering recipe… it’s more of a method. 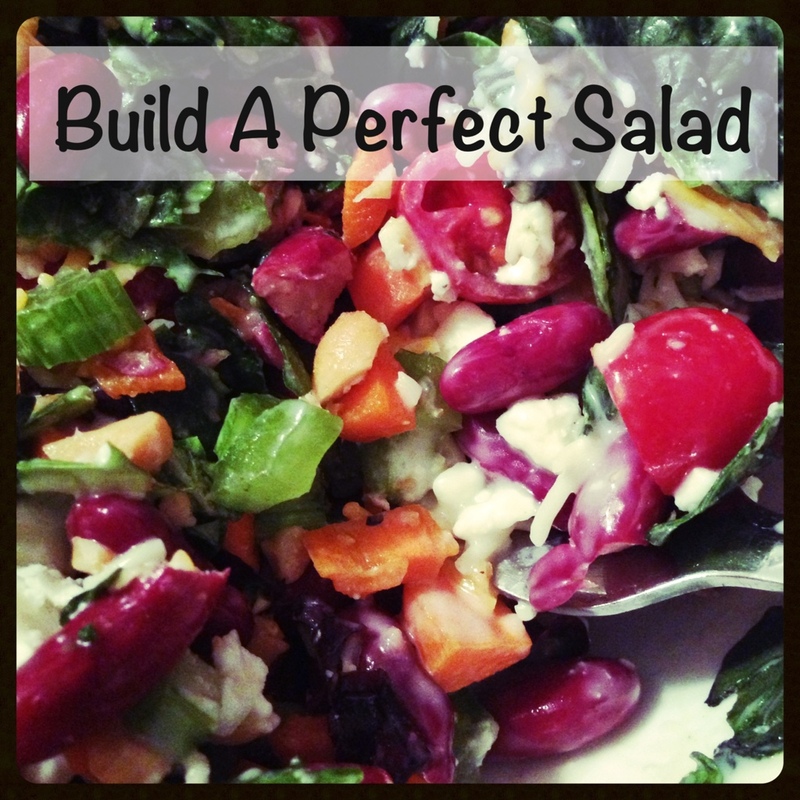 But it’s gotten me to build and eat more substantial salads instead of a bowl full of mainly leaves. This one was inspired by my friend Rhonda* who came over to visit me the other day. We chatted about fish in foil packets and it got my mouth watering for veggies made the same way. I only made one serving because my husband took our oldest out for some male-bonding time, so I was on my own with the toddler. This could easily be a vegetarian’s main course and a side dish for a non-vegetarian. 1. Preheat the oven to 375°. 2. Get two 1 foot long sheets of foil. Lay one out flat, set the other aside. 3. Cut the vegetables if you haven’t already. 4. 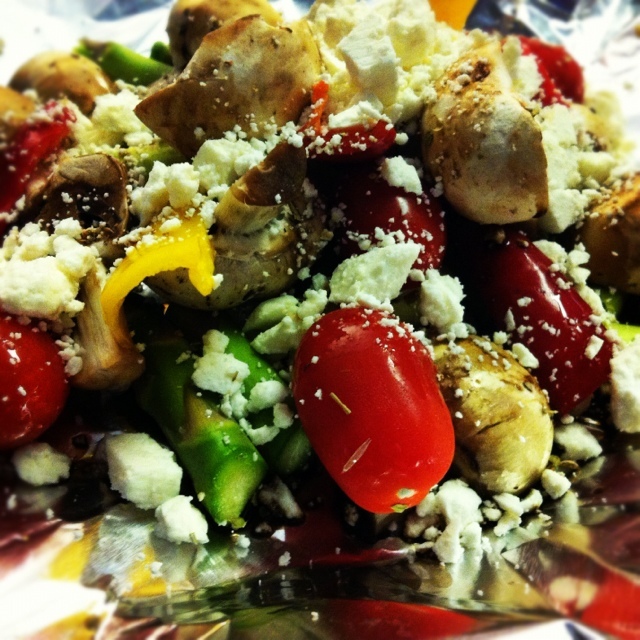 Place the asparagus, mushrooms, tomatoes, bell pepper, and feta in the center of one sheet of foil. 5. Drizzle the vegetable and feta mix with olive oil and balsamic vinegar. Sprinkle with oregano and Parmesan. 6. Seal the foil packet tightly. Place the foil packet, seam down, on the other sheet of foil and seal the second foil sheet around the vegetable foil packet. 8. Open the packet, let cool a few minutes, and enjoy! * Names have been changed to protect the “innocent”! Haha!